The Beverly Hills Hotel - Dorchester Collection places you within a mile (2 km) of popular attractions like Rodeo Drive and Century City. This 5-star hotel welcomes guests with 208 rooms and conveniences like a full-service spa, an outdoor pool, and a 24-hour fitness center. Enjoy dining at the hotel's 2 onsite restaurants: The Polo Lounge specializes in American cuisine and serves breakfast, brunch, lunch, and dinner; The Cabana Café offers relaxing pool views. Satisfy your hunger without leaving your room with 24-hour room service, or quench your thirst with a beverage at the bar/lounge or coffee shop/café. Start each morning with full breakfast, available for a fee from 6 AM to 10:30 AM. A plasma TV comes with satellite channels and a DVD player, and guests can stay connected with free WiFi. Beds sport premium bedding and the bathroom offers a hair dryer and free toiletries. Other standard amenities include an MP3 dock, a minibar, and free newspapers. The Beverly Hills Hotel - Dorchester Collection features a full-service spa, an outdoor pool, and a 24-hour fitness center. Valet parking is available for USD 50.00 per night, and there's also limo/town car service. Multilingual staff at the front desk are standing by 24/7 to help with tours or tickets, securing valuables, and dry cleaning/laundry. Other amenities at this luxury hotel include a spa tub, a sauna, and free WiFi in public areas. In addition to a full-service spa, The Beverly Hills Hotel - Dorchester Collection features an outdoor pool and a spa tub. Dining is available at one of the hotel's 2 restaurants and guests can grab coffee at the coffee shop/café. Guests can unwind with a drink at one of the hotel's bars, which include a poolside bar and a bar/lounge. A computer station is located on site and wireless Internet access is complimentary. Business amenities at this 5-star property consist of a 24-hour business center, limo/town car service, and a meeting room. Event facilities measuring 17730 square feet (1647 square meters) include conference space. This Art Deco hotel also offers a 24-hour fitness center, a sauna, and spa services. A complimentary area shuttle within 5.00 mi is available for guests. Parking is available onsite for a surcharge. 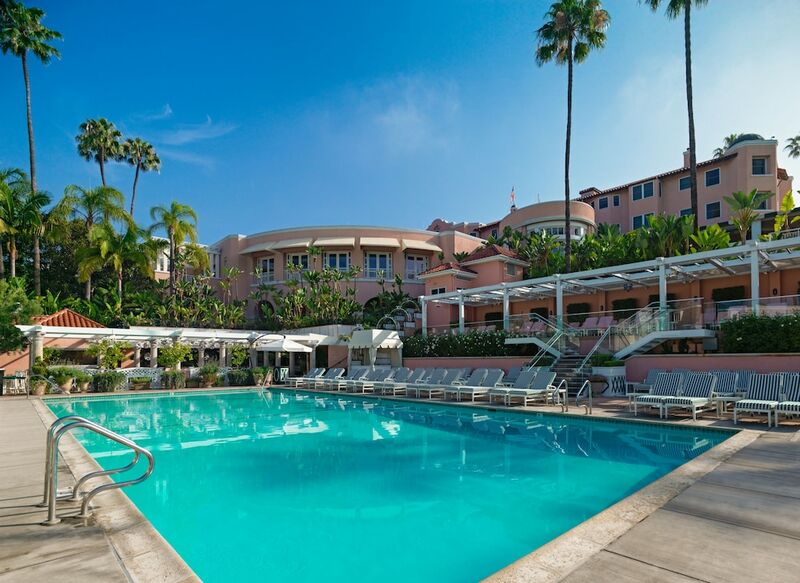 The Beverly Hills Hotel - Dorchester Collection is a smoke-free property. The Beverly Hills Hotel - Dorchester Collection offers 208 air-conditioned accommodations with MP3 docking stations and DVD players. Each accommodation is individually furnished and decorated. Beds feature premium bedding. Plasma televisions come with premium satellite channels, video-game consoles, and pay movies. Bathrooms include separate bathtubs and showers, bathrobes, slippers, and complimentary toiletries. Guests can surf the web using the complimentary wireless Internet access. Business-friendly amenities include desks, complimentary newspapers, and phones. Additionally, rooms include minibars and safes. Microwaves, refrigerators, and in-room massages can be requested. A nightly turndown service is provided and housekeeping is offered daily. The Polo Lounge - Overlooking the garden, this restaurant specializes in American cuisine and serves breakfast, brunch, lunch, and dinner. Guests can order drinks at the bar and enjoy alfresco dining (weather permitting). A children's menu is available. Open daily. The Cabana Café - This poolside restaurant specializes in American cuisine and serves breakfast, brunch, lunch, and light fare. Guests can order drinks at the bar and enjoy alfresco dining (weather permitting). A children's menu is available. Open daily. Bar Nineteen12 - Overlooking the garden, this bar serves dinner and light fare. Guests can enjoy alfresco dining (weather permitting). Open select days. Fountain Coffee Room - This diner specializes in American cuisine and serves breakfast, brunch, lunch, and light fare. A children's menu is available. Open daily. Start your morning with a full breakfast, available each day from 6 AM to 10:30 AM for a surcharge. You can order up room service around the clock. Beverly Hills Hotel Spa has 6 treatment rooms including rooms for couples and outdoor treatment areas. Services include deep-tissue massages, hot stone massages, sports massages, and Swedish massages. A variety of treatment therapies are provided, including aromatherapy. The spa is equipped with a sauna and a steam room. Reservations are required for massage services and spa treatments. Reservations can be made by contacting the hotel prior to arrival, using the contact information on the booking confirmation. The property has connecting/adjoining rooms, which are subject to availability and can be requested by contacting the property using the number on the booking confirmation. The property allows pets in specific rooms only and has other pet restrictions (surcharges apply and can be found in the Fees section). Guests can arrange to bring pets by contacting the property directly, using the contact information on the booking confirmation. The Beverly Hills Hotel - Dorchester Collection is listed in the 2016 Condé Nast Traveler Top 100 List.